(Nanowerk News) An international team of astronomers and an exotic pair of binary stars have proved that Albert Einstein's theory of relativity is still right, even in the most extreme conditions tested yet. 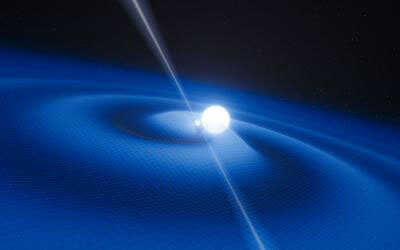 The results of their research are described in the April 26 issue of Science ("Pulsar Tests Gravity"). "The unusual pair of stars is quite interesting in its own right but we've learned it is also a unique laboratory for testing the limits of one of our most fundamental physical theories, general relativity" says University of Toronto astronomy professor Marten van Kerkwijk, a member of the research team. What makes the pair of stars exceptional are the unique characteristics of each and their close proximity to each other. One is a tiny but unusually heavy neutron star – one of the most massive confirmed to date. Named PSR J0348+0432, it is the remnant of a supernova explosion, and is twice as heavy as the Sun yet is only 20 kilometres across. The neutron star is a pulsar that gives off radio waves that can be picked up on Earth by radio telescopes. The gravity at its surface is more than 300 billion times stronger than that on Earth and at its centre every sugarcube-sized volume has more than one billion tonnes of matter squeezed into it, roughly the mass of every human past and present. The massive star spins 25 times each second and is orbited by a rather lightweight dwarf star every two and a half hours, an unusually short period. Only slightly less exotic, the white dwarf is the glowing remains of a much lighter star that has lost its envelope and is slowly cooling. It can be observed in visible light, though only with large telescopes – it is about a million times too faint to be visible with the naked eye. In the new work, led by Bonn PhD student John Antoniadis, very precise timing of the pulsar's spin-modulated emission with radio telescopes was used to discover a tiny but significant change in the orbital period of the binary, of eight-millionths of a second per year. Given the masses of the pulsar and the white dwarf, inferred with the help of observations of the light emitted by the white dwarf – using techniques perfected by Antoniadis and van Kerkwijk – this turns out to match exactly what Einstein's theory predicts. Einstein's general theory of relativity explains gravity as a consequence of the curvature of spacetime created by the presence of mass and energy. As two stars orbit each other, gravitational waves are emitted – wrinkles moving out in spacetime. As a result, the binary slowly loses energy, the stars move closer, and the orbital period shortens. The test posed by PSR J0348+0432 is particularly interesting because the massive star is a truly extreme object in terms of gravity, even compared to other pulsars that have been used to test general relativity. As a result, it causes exceptionally strong distortion of spacetime. In many alternatives to Einstein's theory, this would cause the orbit to lose energy much faster than is observed. "The observations disprove these alternatives," says van Kerkwijk, "and thus give further confidence that Einstein's theory is a good description of nature – even though we know it is not a complete one, given the unresolved inconsistencies with quantum mechanics." "We really are just at the beginning of our studies of this massive and bizarre stellar object," says Antoniadis. "It may become the new standard for testing general relativity as time goes on."